← How Can You Help Hurricane Sandy Victims? 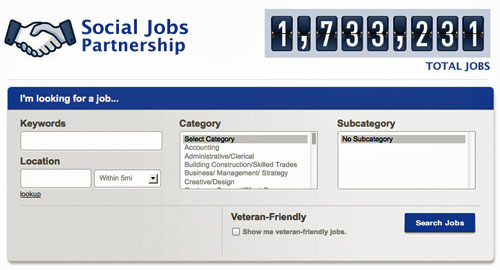 CIO.com is reporting on a new job search app on Facebook called Social Jobs Partnership. “The social network, on which many users have struggled to define their work-life division, partnered with the U.S. Department of Labor, the National Association of Colleges and Employers (NACE), the DirectEmployers Association and the National Association of State Workforce Agencies to produce a new Facebook app to let you find and share employment opportunities. “The Social Jobs Partnership app is “a central location where recruiters can share open positions with the Facebook community sorted by industry, location and skills,” Facebook says,” reports CIO. I gave the new app a try but was a bit disappointed. It found no journalism jobs in the Chicago area. I’m not sure if that speaks to the lack of journalism jobs or the lack of jobs in this new app at the moment. But using it seems to be free, so perhaps you might have better luck in your chosen field.